Set of cute doodle cats. Outline animal art. Cute cartoon animals. A set of silhouette icons of thick, multi-colored cats with a mustache, on a white background. 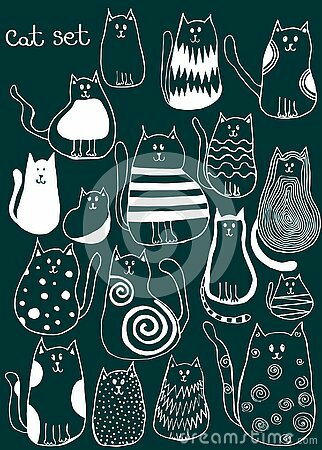 Vector illustration cute cats icons set. Sweet kittens stickers in flat style. Set of cute funny stickers with color doodles of different cats with quotes. Isolated objects. Hand drawn vector illustration. Cartoon cats in doodle style. Colorful funny animal set.